The Stay Strong Project is a kind of 'We are the World' concept for the chant and yoga community initiated by a song I wrote entitled Stay Strong. 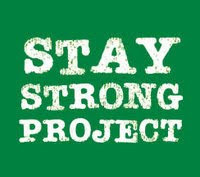 The Stay Strong Project has partnered with Global Green USA, www.globalgreen.org, an organization involved in supporting efforts for the Gulf Coast recovery and other environmental and humanitarian concerns, including: green building, climate solutions, security and sustainability and clean water projects. Stay Strong will be released as a song and video, with 100% of the proceeds going to Global Green, USA. Joining Mira and I on The Stay Strong Project are: Krishna Das, Seane Corn, Jai Uttal, Wah, Sharon Gannon, Snatam Kaur, Sean Johnson, Donna De Lory, Gaura Vani, Dave Stringer, Girish, Shantala, Shyam Das, Govindas and Radha, Suzanne Sterling, Kirtan Rabbi, Saul David Raye, Bob Wisdom, Radhanath Swami and many more. The vision of The Stay Strong Project is to create a Global message that shows the community coming together through music, song, and prayer, to unite and uplift people and strengthen their ability to help in times of need. ...and enjoy this live version of Stay Strong at Bhaktifest, joined by Mira, Philippo, Steve Gorn, John Dekadt, Kit Thomas, Mary Arden Collins, Dave Stringer and Govindas!